Authored by rizzitello on Nov 8 2018, 9:16 PM. "Like" token, awarded by acrouthamel. Clean up the context menu for the places panel. 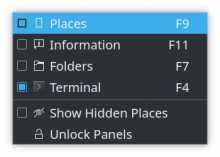 Change Text "Show All Entries" -> "Show Hidden Places"
Disable instead of hide if not places are hidden. Toggle to unchecked if last item of group is unhidden. Create a copy of this "Show Hidden Places" entry in the main dolphin menu View->Places. Why drop "Show" from the label though? Please create the action/checkbox in DolphinMainWindow and just add a public slot here in the panel. rizzitello marked 2 inline comments as done. This puts its text in line with the hidden files entry that is just "Hidden Files". What Elvis meant was Hidden Places → Show Hidden Places. Maybe. Places Panel's context menu says "Show All Entries", not "All Entries", though. Oh, you are re-using the action, that's nice. I will retract all my comments and let maintainer decide. I would prefer 'Show Hidden Files" and "Show Hidden Places" for clarity over brevity. We also say "Show Menubar", "Show Filter Bar", etc. rizzitello marked 4 inline comments as done. +1 for making the text say "Show Hidden Places". Lovely. Consider it VDG-approved! I'll let @elvisangelaccio handle the remainder of the code review. I don't think this comment adds any value, code is already self-explanatory. I'd just remove it. Please add this as parent, otherwise it will leak (see D16817). We don't need to capture this here. The slotXXX prefix is usually used for private slots. We can just call it showHiddenEntries(). rizzitello marked 6 inline comments as done. We don't make menu items conditionally disappear. Please only disable it when it can't be used, don't hide it. Well, we already do for the action in the places panel context menu (same in the KIO one). Shouldn't we be consistent with that? Ah yes, we should fix those as well. We always try to disable inapplicable items rather than hiding them. The HIG says this, but it's kind of hidden away in https://hig.kde.org/patterns/content/settings.html?highlight=inapplicable. 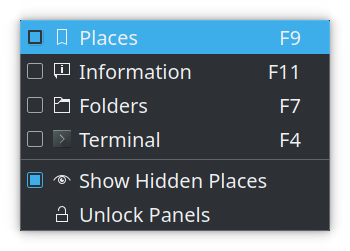 I'll make that more obvious on the https://hig.kde.org/components/navigation/menubar.html and https://hig.kde.org/components/navigation/contextmenu.html pages, too. I'm fully behind Nate on this one. I found the disappearing item in the context menu quite confusing myself when looking into this, even as I understood logically why it was probably not there. The combination of an on-again, off-again context menu, the Places items I removed _or_ hid, and the ability to also hide the Places part of the panel itself was really playing some tricks on me. I would strongly prefer that the options are disabled, but still visible in the menus. since it's how you are actually using it. ONE PROBLEM HERE: Can not get a count of hidden Items on start up. the count for hidden items is always 0. So the Menu entry always starts enabled. Any help here would be great. Try to delay the menu initialization using a QTimer::singleShot(0, ...). The places model gets populated asynchronously. Nate had suggested using the QMenu::aboutToShow to enable and disable the item. Other then a crash if the panel was not created yet this worked perfectly from the start. I have added a check to see if our model if valid to avoid crashing while preserving the disable behavior. This should be ready for a final test now. Thanks, this is great UI-wise now! Big thumbs up. This should have been pushed on master, Applications/18.12 is feature frozen since 15th November. Given that we are only two days late, I think we can ask for an exception, but next time please be careful.